Money raised in the name of 4-H must be handled properly. 4-H money is public money and was raised with the specific purpose of supporting and furthering educational programming for youth. There are implications not only for the use of 4-H money, but there are also implications of insurance, liability and other risk issues for any major expenditure. All 4-H Clubs/Groups that have a checkbook must complete the 4-H Club/Group Annual Financial Report as part of the Annual 4-H Charter Renewal process. This report includes documentation of 4-H funds received and disbursed, documentation of all 4-H accounts held by the Clubs/Groups and annual audit information. 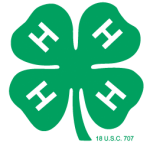 The 4-H fiscal year is July 1 through June 30. It is recommended that the 4-H Annual Financial Report be completed shortly after the end of the fiscal year. 4-H Clubs/Groups must comply with state and federal laws for nonprofits and IRS requirements. Wisconsin 4-H Clubs/Groups are federally tax exempt through inclusion as a subsidiary of the General Exemption Number (GEN) held by University of Wisconsin-Extension for 4-H Clubs/Groups.